My son love, love, loves the taste of coffee desserts. For his birthday, he wanted cookies so I made coffee white chocolate chip and these - mocha moon pies. They're like like little puffs of happiness. 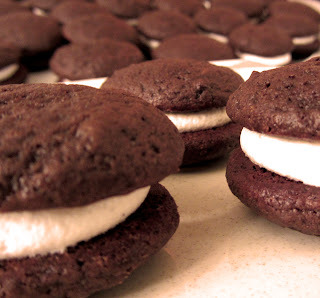 The recipe is adapted from Whoopie Pies by Sarah Billingsley and Amy Treadwell. They're easy to make and delicious! 1. Preheat the oven to 350°. Line baking sheets with parchment paper. 2. For the Cookie-Cakes: in a liquid measuring cup, stir together the milk, vanilla, and instant coffee/espresso. Set aside. 3. In a medium bowl, stir together the flour, sugars, cocoa powder, baking soda, and salt. Set aside. 4. In the bowl of a stand mixer, beat the butter and shortening together until light and fluffy. 5. Beat the egg into the butter mixture until well blended, scraping the bowl as necessary. 6. With the mixer on low, add the dry ingredients and the wet in alternating order, starting with the dry (1/3 dry, 1/2 wet, 1/3 dry, 1/2 wet, 1/3 dry). Beat just until blended - do not overmix. 7. Give the batter a couple of stirs with a large rubber spatula. 8. Scoop tablespoonfuls of the batter onto the prepared baking sheets, leaving 2" between each. 9. Bake for 6-8 minutes or until the edges are done and the centers are set. 10. Transfer the cookie-cakes to racks to cool completely. 11. For the Filling: in the bowl of a stand mixer, combine the marshmallow, butter, and shortening. Beat until fluffy. 12. Beat in the vanilla and espresso powder. 13. Beat in the powdered sugar until the mixture is smooth and fluffy. 14. Spread or pipe the filling onto half of the cooled cookie-cakes. Top with the unfilled cookie-cakes. Serve!